Not just another Pull-up bracket! Specially design for a clean, high-end look and feel, with practicality of integrated anchors for suspension trainers along with dedicated storage hooks. 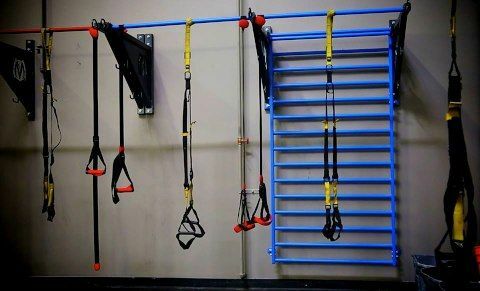 They also provide the option to daisy-chain together for one long continuous pull-up bar configuration and suspension training station for desired length. 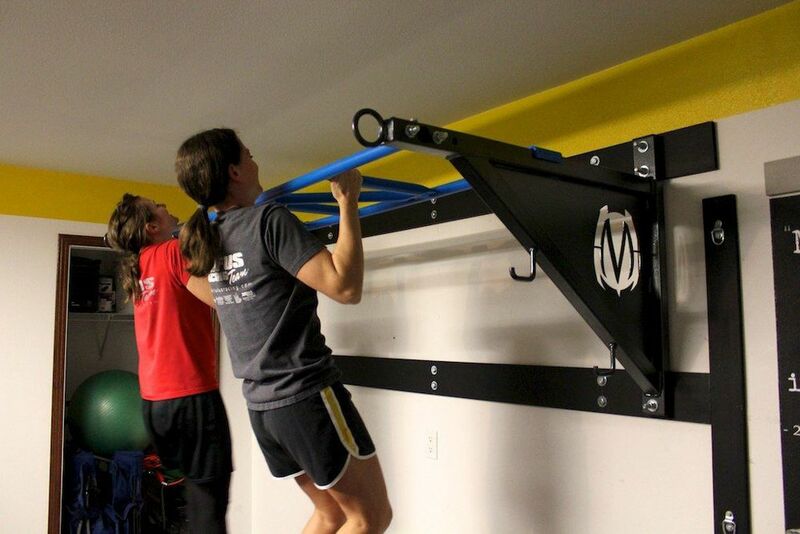 Or just use two brackets with any of the bolt-on MoveStrong pull-up bar options: Standard Grip,Bent Grip, Fat Grip, Globe Grip, Z Bar, Monkey Bar, Sliding Pull-up™, or the new Revolver Pull-up Bar! 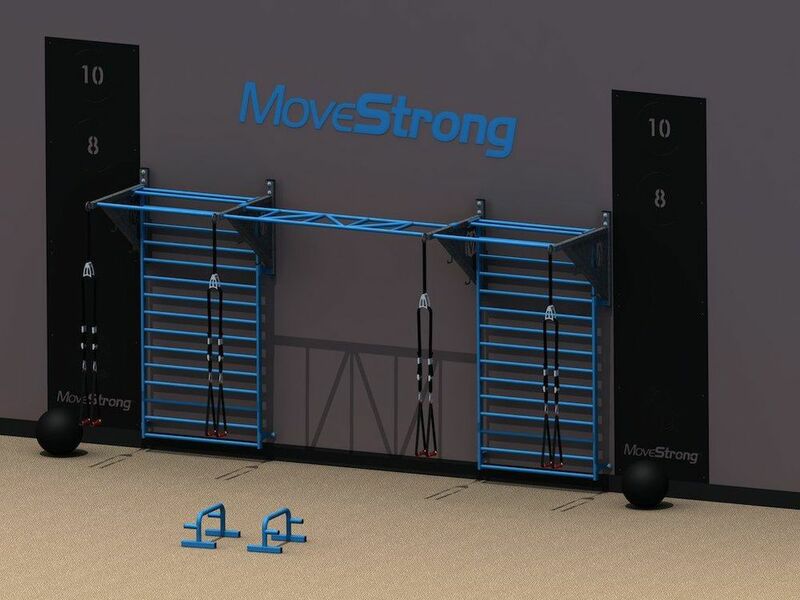 MoveStrong Stall bars are sold separately and available to go between two pull-up brackets for additional options, or they are available as a flush wall mount. 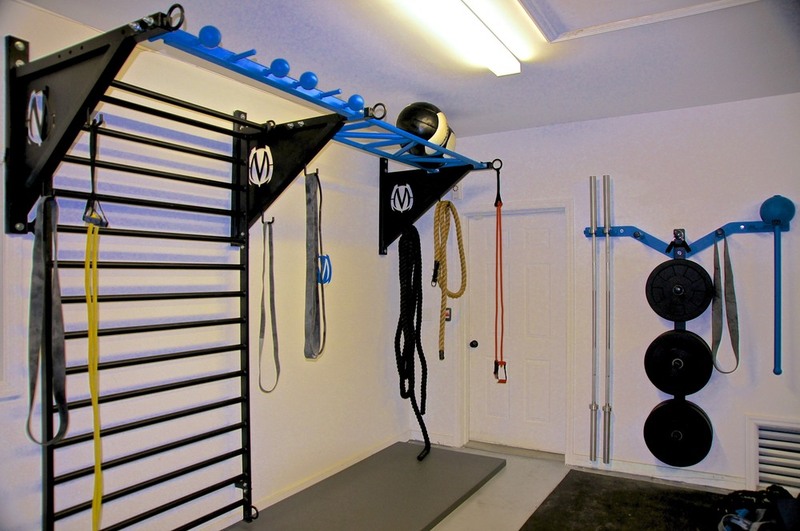 Stall bars add another great bodyweight training and stretching tool to maximize your training space. Pull-up brackets provide 40" of distance from wall giving good space to minimize wall damage. Dedicated eye-loop anchor points for suspension trainers and other accessories. Two storage hooks per bracket for holding resistance bands and accessories. 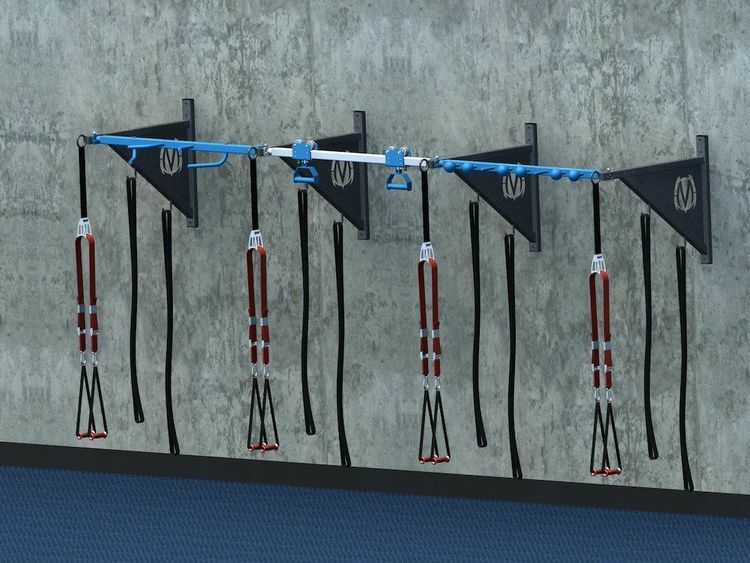 Interchangeable pull-up bars with bolt-on bar options such as Standard Grip, Bent Grip, Fat Grip, Globe Grip, Z Bar, Monkey Bar or Sliding Pull-up™. Pull-up bracket's daisy-chain design allow for adding varied pull-up bars as desired for overall length. 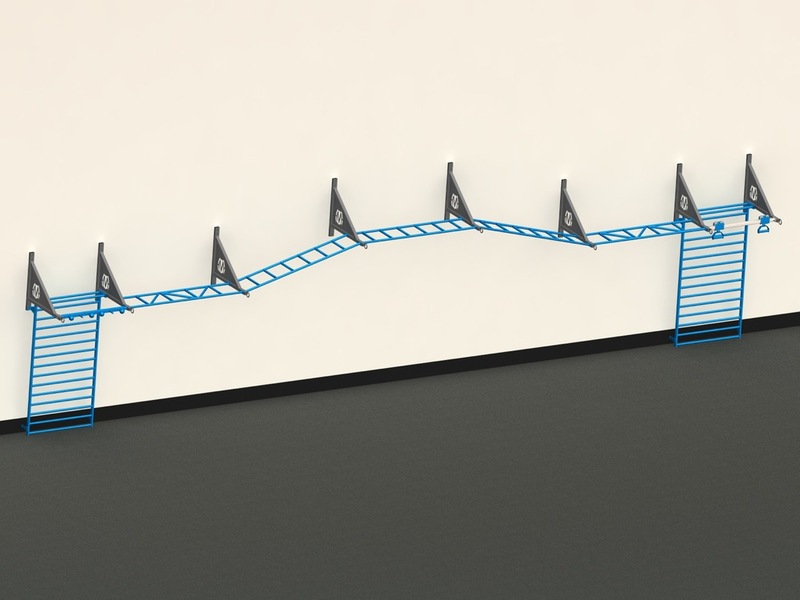 Pull-up bracket's inverted design allows for continuous climbing with Monkey bars or Z Bars. For building your own design, order a minimum of two brackets. All brackets used with 46" Bars are spaced at 48"
All brackets used with Monkey Bars are spaced at 80"
Installation guide provided. Install on wood stud, concrete, or block wall using the proper anchoring hardware. Pull-up Brackets: Silver Vein Gloss Powder Coat. Pull-up Bars: MoveStrong Blue Textured Powder Coat. Also available in Black. Please inquire about custom colors. (2) Storage hooks and (1) dedicated eye-loop anchor point are standard per bracket. (1) Dedicated eye-loop anchor point is standard per bracket. Pull-up Brackets sold individually. Minimum of 2 Brackets required. Strong sturdy design with laser cut logo. 40" spacing from wall. (2) Storage hooks and (1) dedicated eye-loop anchor point per bracket for additional training devices. 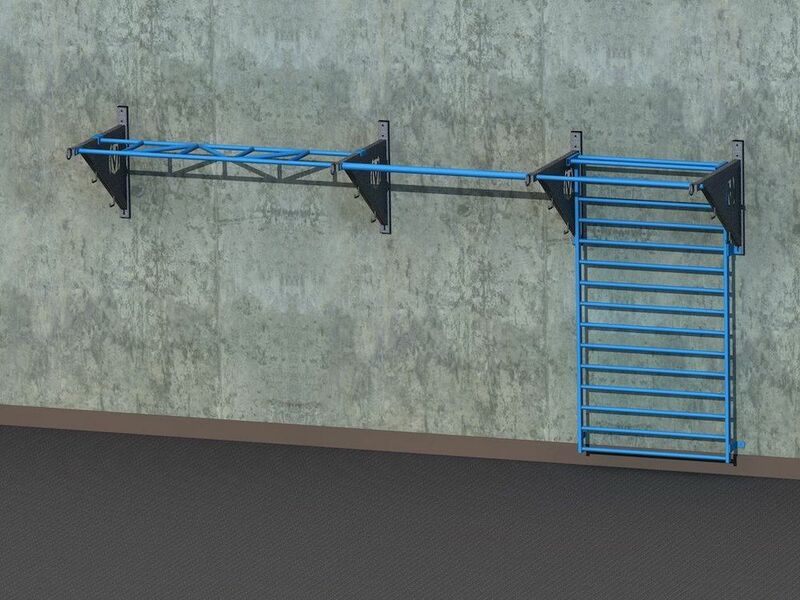 Can be configured with as many brackets as desired with Pull-up bars, Sliding Pull-up Bar, Stall bars, Monkey bars or Z Bars to create the Pull-up Bracket system you desire. Inverted Pull-up Brackets sold individually. Minimum of 2 Brackets required. (1) dedicated eye-loop anchor point per bracket for suspension trainers or resistance bands. 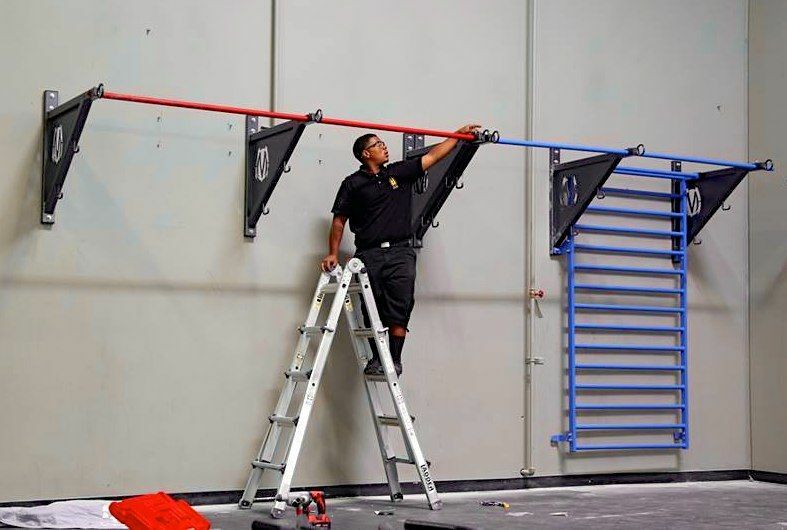 Once you have decided on the type and number of brackets, now choose between the following Pull-up Bar options to complete your system: Standard grip, Fat grip, Bent grip, Globe grip, Sliding Pull-up, Monkey bar, Z bar, and Stall Bars. *Note* Stall Bars are available to go between two Pull-up Brackets as shown below, or are available as a flush mount (small Flush Mount Brackets Included). Each bracket has a dedicated anchor point for suspension trainers, and storage hooks for accessories. After you have customized your Pull-up Bracket System, add the appropriate items to your shop cart. View the multiple configurations to make sure you are adding the correct options. Minimum of (2) Pull-up Brackets required.